Eastern Continental Trail's northern component. This map does not show trails through Nova Scotia or Prince Edward Island nor the more recent additions on the eastern side of the Atlantic. The International Appalachian Trail (IAT; French: Sentier international des Appalaches, SIA) is a hiking trail which runs from the northern terminus of the Appalachian Trail at Mount Katahdin, Maine, through New Brunswick, to the Gaspé Peninsula of Quebec, after which it follows a ferry route to Newfoundland, and then continues to the northern-easternmost point of the Appalachian Mountains at Belle Isle, Newfoundland and Labrador. In 2009, IAT discussed with the British Geological Survey in Scotland whether to extend the IAT to the Appalachian terrains of Scotland, Ireland, Northern Ireland and Wales, setting off a series of expansions through Europe and Northern Africa. As of July 2015, there were IAT walking trails in Greenland, Iceland, Norway, Sweden, Denmark, Scotland, Northern Ireland, Ireland, Isle of Man, Wales, England, France, Spain, Portugal and Morocco. The IAT was proposed in 1994 by Richard Anderson, a Maine fisheries biologist, with plans to traverse the portions of the Appalachian Mountains in Maine, New Brunswick, and Quebec that the Appalachian Trail did not cover. Following route selection, construction of the trail took place through the late 1990s. The first person to thruhike the IAT, as it then existed, was John Brinda from Washington State, in 1997. He did this as part of his thruhike of the Eastern Continental Trail starting in Key West, Florida. He was the first person to thruhike the entire Eastern Continental Trail. The Newfoundland and Labrador extension to the IAT was proposed in 2003 and is still under construction. When completed, it will add an additional 1,200 km of trail. The official opening of the first trail section of the IAT Newfoundland was September 23, 2006. 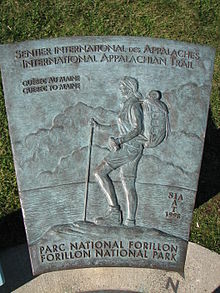 The IAT extends northeast from the northern terminus of the Appalachian Trail at Katahdin, Maine to Mars Hill, Maine, before following the U.S.-Canada border north to Fort Fairfield, Maine, where it crosses the border into Perth-Andover, New Brunswick. It continues up the Tobique River valley to Mount Carleton before crossing the Miramichi Highlands to the Restigouche River valley in Quebec and along the Chic-Choc Mountains of the Gaspé Peninsula, ending at the peninsula's easternmost point, Cap Gaspé in Forillon National Park. End of the trail in Quebec at Cap Gaspé. From Cap Gaspé, the IAT skips to Prince Edward Island, Nova Scotia, and over the Gulf of St. Lawrence to Newfoundland, where the trail picks up again at Channel-Port aux Basques and follows the west coast of the island up the Great Northern Peninsula before terminating at the island's northernmost tip, Cape Bauld. From there the IAT skips over the Strait of Belle Isle to the northern terminus of the Appalachian Mountain chain at Belle Isle. Geological evidence shows that the Appalachian Mountains, certain mountains of Western Europe, and the Anti-Atlas range in North Africa are parts of the ancient Central Pangean Mountains, made when minor supercontinents collided to form the supercontinent Pangaea more than 250 million years ago. With the break-up of Pangaea, sections of the former range remained with the continents as they drifted to their present locations. Inspired by this evidence, efforts are being made to extend the IAT into Western Europe and North Africa. In April 2010 Greenland became the seventh chapter of the International Appalachian Trail. The route is on the Nuussuaq Peninsula near Uummannaq Fjord. Greenland was followed by Scotland in June, when the West Highland Way became the first IAT trail in Europe. Spain also joined the IAT in 2010. This page was last edited on 24 August 2018, at 21:52 (UTC).